Welcome to harvest season California-style. September through November is ideal for visiting SoCal farms and orchards to pick your own apples, pears and pumpkins, press cider and enjoy a country picnic under autumn blossoms. 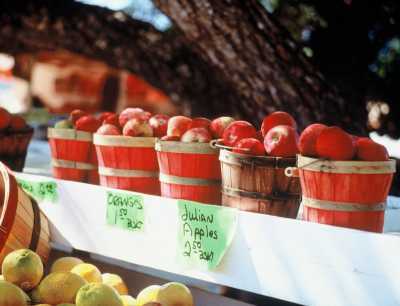 U-pick apple prices vary but average $2.50 a pound. Berries cost more. Short on time? Local farmers markets offer the goods too. For a list of certified farmers markets visit FarmerNet. Not all have harvest festivals but the following are among the cream of the crop. Since 1934 when a group of farmers displayed fresh goods on a lot at Third Street and Fairfax Avenue in L.A., the market has grown into a full service open-air commerce with vendors, restaurants, and entertainment. Each year the free Fall Festival attracts families for pumpkin carving, crafts, live music, petting zoo, and events such as a pig race, and pie-eating contest from 11 a.m. – 6 p.m. Oct. 19 and 20. 6333. W. Third Street, L.A. The City of Santa Monica oversees four farmers markets packed with farm fresh produce and seasonal events. Free, no-carve pumpkin decorating takes place from 10 a.m. – 1 p.m. Oct. 20 at Main Street Farmers Market in Heritage Square (2640 Main Street, Santa Monica), and from 9 a.m. – 1 p.m. Oct. 26 at Pico Farmers Market in Virginia Avenue Park (2200 Virginia Ave, Santa Monica). On Oct. 30, stack and balance all the pumpkins you can carry to the end of the 25-foot pumpkin patch lane and they’re yours to keep for $5 total! From 9 a.m. – 1 p.m. The fully operational working farm in Moorpark offers U-pick produce, a farm stand, animal center and seasonal events. The 16th Annual Fall Harvest Festival features pumpkin carving tips, music, corn maze, hay pyramid, wagon rides and food from 9 a.m. – 6 p.m. Sept. 28 – Oct.31. The festival spans a large portion of the fields but you can still pick your own blackberries, raspberries, tomatoes and peppers. Festival admission $12 weekends, $3 weekdays. 3370 Sunset Valley Road, Moorpark. Wynola Flats Produce & Orchards, established in the 1890s, is operated by fourth generation farmer David Lewis. The heirloom apples as well as bushels of other varieties are sold at the family’s fruit stand. He also gives 90-minute historical tours of Julian that begin in the ancient cemetery. Tours start at $30. Dapple in apples and art at Raven Hill Orchards where the Brady brothers tend 8,000 trees that produce seven varieties of apples. U-pick hours: 9 a.m. – 5 p.m. daily. Patrick Brady, a farmer and artist unleashes his artistic side in his whimsical sculpture garden. 1284 Julian Orchards Drive, Julian; 760-765-2431. Calico Ranch, a family-run apple and pear orchard, offers a big selection of U-pick from 10 a.m. – 4 p.m. weekends starting in October. More than 130 varieties of apples are grown on-site as well as several varieties of pears. On Highway 78 before Calico Ranch Road. The Julian Mining Company offers a U-pick pumpkin patch, hay rides, apple pressing and candle-making. $12.95 adults, $9 kids. Also, discover gold and minerals using gold pans and sluice boxes. $8.95 adults, $6.95 kids. Oak Glen, about 90 minutes from L.A. (between Palm Springs and Big Bear), is home to several farms where you can pick fruit and press cider. Riley’s Apple Farm in Los Rios Rancho) is a working historical farm chock full of pioneer activities such as rope-making and log cabin-stacking. 10 a.m. – 4 p.m. weekends. Call for weekday appointments. 12261 S. Oak Glen Road, Oak Glen. Mimi Slawoff writes a monthly family travel column in L.A. Parent magazine (www.laparent.com). For more travel tales and tips, follow Mimi on Twitter @mimitravelz. Previous Post: « Do You Love Lucy?